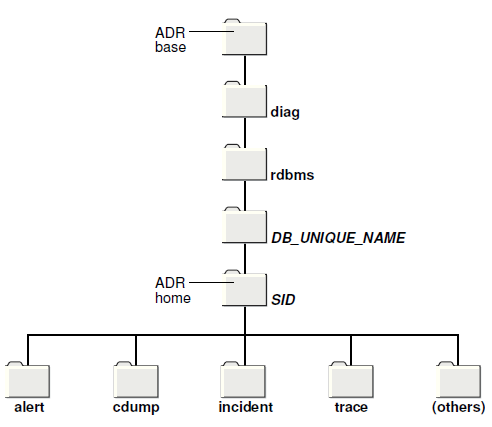 Note: "When client side OCI or NET have an incident, an ADR directory is created in the user's home and the incident and dumps are located within. The root is named oradiag_<username>. So finding this directory structure indicates some failure on the client side. The reason the ADR is created in the user's home directory and not in the Client Oracle home: permissions. I was puzzled that my db server host had this directory even though I've never installed the Client there. Dev explained that "Every DB interaction uses OCI (SQLPLUS, etc.) from a client side." Thus you use it during install, for example, often without knowing it. Viewing diagnostic data within the Automatic Diagnostic Repository (ADR). Packaging of incident and problem information into a zip file for transmission to Oracle Support. adrci> ips create package problem ? adrci> ips create package problemkey "?" $ adrci exec="show homes; show incident"
adrci> show log -p "message_text like '%tablespace%'"
The ADR Metadata folder contains, right now, 44 files that are external tables queryable via adrci using SQL: External tables that are not visible in CDB_OBJECTS_AE. Start by making a list of the current metadata file names and then try these examples using your file names if they differ from mine.